Have you ever seen a request on HubPages that you wanted to answer, but you didn’t want to write a whole hub on the subject? Now, you don’t have to, because we are introducing a new way to briefly answer a request without building a hub. We hope that this will encourage more people to ask questions and more people to answer them. 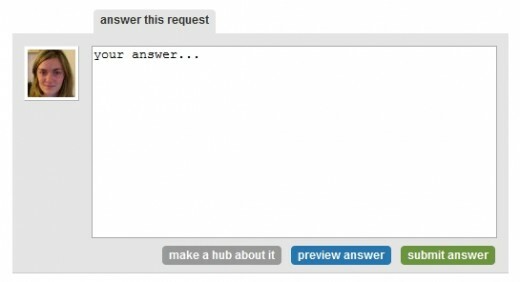 If you want to answer the request without writing a hub, then you can type your answer in the box and submit it by clicking on the “submit answer” button. If you’d rather write a hub response, then click on the “make a hub about it” button. Anything that you have written in the text box will be saved and put into a text capsule in your new hub, so don’t worry about losing what you’ve written. The number in parentheses (+1) tells you that this answer has received one up vote. We hope that you like this new feature. As always, please let us know what you think by posting in the forums (or leave a comment).